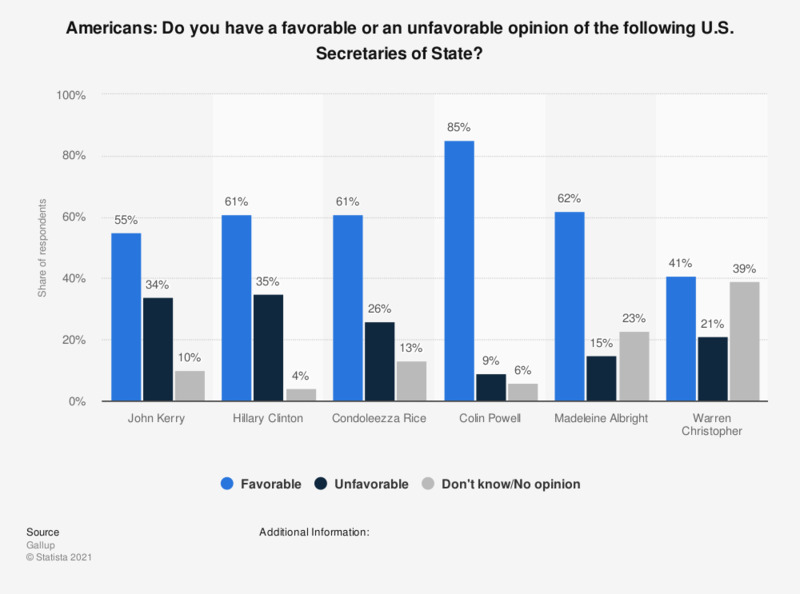 Americans: Do you have a favorable or an unfavorable opinion of the following U.S. Secretaries of State? This statistic, conducted by Gallup on several occasions from 1994 to 2014, shows the Americans' opinion on selected U.S. Secretaries of State after approximately one year in office. When asked in 2002, some 85 percent of respondents stated they have a favorable opinion of Colin Powell. Warren Christopher, January 6-8, 1994. The respondents were polled approximately one year the respective Secretary of State hat taken up office. The source does not provide the number of respondents for the years prior to 2014. The source does not provide the wording of the question. The wording chosen here may therefore differ slightly. Do you want the southern Brazilian states of Paraná, Santa Catarina and Rio Grande do Sul to form an independent country? To what extent do you agree that you how political parties in the United Kingdom (UK) go about developing their policy ideas? Following the result of the EU referendum, how confident are you that the United Kingdom (UK) government will improve public services, such as hospitals and schools?